A few weeks ago I learnt about flicking! If you are late to the party just like me, flicking is a variation of the English knitting method. Similar to Continental, flicking facilitates both hands to stay in the needles instead of dropping a needle to throw the yarn as you do with traditional English knitting. Fascinated by the possibility of reducing hand movements and therefore knitting a bit faster, I've watched a good number of YouTube videos to learn the technique. If interested, I recommend you do do a search on "Flicking knitting" in YouTube. Knitting a cowl with simple knit and purl stitches is providing good practice on this new to me technique. I am a convert, my friends! There is not much to say now about my WIP as it is just a few rows in. I will blog about the pattern and yarn in a later post. I'm a flicker too! Although, I think I un-vented it. I was sick of letting go of the needle, so one day I just didn't. LOL. Maybe you advanced the technique :-) I was watching a podcast and the lady said she was taking a class about it. Not one to leave any page unturned, I quickly googled it. Curiosity pays off! 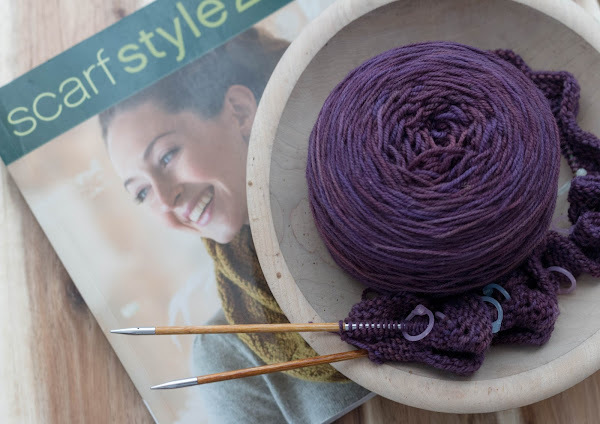 I taught myself to knit out of a magazine when I was quite small (about age 8-9, I believe), and I've always been a flicker! I had no idea it was a real technique until last year. I had always just assumed I was doing English/throwing style, and I was confused when people said English style was so much slower than Continental, since I was and am quite quick. Come to find out I'm doing something pretty different! I also think the flicking style makes purl stitches about 1000 times easier. Interesting. I knit continental but the lady I worked for at my lys had developed this way of knitting English, also, and she was very fast! I have tried too many times to learn continental. I can't purl like that to save my life. The flicking thing is a good compromise. Thanks for stopping by Karen!